Lady: What is a baby? I just can't understand. It must be something wonderful. It must be something grand. 'Cause everybody's smiling, in a kind and wistful way, and they haven't even noticed that I'm around today. Trusty: [very loudly] Ohh, Miss Lady, ma'am? Miss Lady! Tramp: Aw, come on, Pige. It wasn't my fault. Lady: Oh, don't even mention that horrible place. Tramp: Oh, now, now. Who could ever harm a little trick like you? Lady: [Angry] Trick? Trick! Oh, that reminds me. Who is Trixie? Lady: And Lulu and Fifi and Rosita Chiquita wh... whatever her name is? Lady: As far as I'm concerned, you needn't worry about your old heel. Lady: I don't need you to shelter and protect me. Lady: If you grow careless, don't blame me. And I don't care if the Cossacks do pick you up! Goodbye! And take this with you! Trusty: As my grandpappy, Ol' Reliable, used to say... I don't recollect if I ever mentioned Ol' Reliable before? Si, Am: We are Siamese if you please. We are Siamese if you don't please. Tramp: Now take the Schultzes here. Little Fritzy - that's me, Pidge - makes this his Monday home. Tramp: [German accent] Ach, ja! Mondays is Mama Schultz cooking der Wienerschnitzel. Tramp: [Irish accent] Now, O'Brien's here is where little Mike - sure'n that's me again, Pidge - Comes of a Tuesday. Tramp: [Continuing accent] Begorra, that's when they're after havin' the darlin' corned beef. Tramp: You see, Pidge, when you're foot loose and collar-free, well, you take nothing but the best. Tramp: [to a pair of pigeons] Hi, gals. How's pickin's? Trusty: You see, miss Lady, there comes a time in the life of all humans when uh... well as they put it... uh, the birds and the bees? Jock: What he's tryin' to say, Lassie, is, Darling is expecting a wee bairn! Trusty: He means a baby, miss Lady. Trusty: That's right, Miss Lady; as my grandpappy, Ol' Reliable used to say... I don't recollect that I've ever mentioned Ol' Reliable before? Jock: Aye, ye have, laddie. Frequently. Beaver: [struggling with a log] Ah-ah-ah, busy sonny, busy! Gotta slide this sycamore to the - ung - swamp! Beaver: Only a second! Listen, listen sonny, you realize every second, seventy centimeters of water is wasted over that spillway? Beaver: Gotta get this log movin', sonny, gotta get it movin'! T'ain't the cuttin' take's the time, it's the doggone haulin'! Tramp: What you need is a log puller. Tramp: I SAID A LOG PULLER! Beaver: I ain't deef, sonny. There's no need to... Did you say log puller? Tramp: [like a salesman] Haha, and by lucky coincidence, you see before you, modeled by the lovely little lady, the new, improved, patented, handy-dandy, never-fail little giant log puller. The busy beaver's friend! Tramp: Guaranteed not to wear, tear, rip or ravel. Turn around, sister, and show the customer the merchandise. And it cuts log-hauling time sixty-six percent! Beaver: Sixty-six percent, eh? Figure that! Well, how's it work? Tramp: [demonstrating] Why, it's no work at all! You merely slip this ring over the limb like this, and haul it off! Beaver: Uh, say, d'you mind if I slip it on for size? Tramp: Help yourself, friend, help yourself! Beaver: Okay! Hehe. Don't mind if I do! Uh... how'd'ya get the carn-starnded thing off, sonny? Tramp: Kee-rect, friend. Now bite HARD! Beaver: Say, that is simple! Jim Dear: Darling, Aunt Sarah, come here! Darling: What is it Jim? [gasps] Aunt Sarah: [screams] Aah! A rat! Trusty: A rat! We should've known. Jock: [regretfully] I misjudged him. Badly. Trusty: [running towards the gate] Come on! We got to stop that wagon! Jock: [hurrying after him] But man, we dinnae know which way they've gone! Trusty: We'll track 'em down! Jock: [struggling to keep up] A-a-and then? Trusty: We'll hold 'em! Hold 'em at bay! Bulldog: [to Lady] Peg used to be in the dog-and-pony follies. Professor: Uh, I beg your pardon? Were you addressing me? Police officer: What's the matter?! [shows the professor the "no dogs allowed" sign] Can't you read?! Professor: Why, yes. Several languages. Police officer: Oh, a wise guy, eh? All right now [points to Tramp], what's this creature doing here? Professor: Let go! Go on! Why, certainly not, officer. Police officer: Awe, and I suppose you'll be telling me next it was the dog that was whistling, eh?! Professor: I-I-I'm certain I don't know. Police officer: Oh, so I'm a liar now, am I?! Professor: [Angrily] Well, YOU listen to me! Trusty: Why some of the finest people I ever tracked down were jailbirds. Jock: QUIET! You great looney! Tramp: Ah, cute little rascals! A ciccy ciccy ciccy coo! Lady: Well, I first noticed it the other day when Jim Dear came home. Jock: Now, ah, you see, lassie, neither of is as young as we used to be. Trusty: But we're still in the prime of life. Jock: And we've both got VERY comfortable homes. Tramp: [looking around at the rich end of town] I'll bet they got a lid on every trash can. Tramp: Uh-oh, and a fence around every tree. I wonder what the leash-and-collar set does for excitement? Giuseppe: Wait a minute. Luigi, dogs can't talk! Luigi: He's a-talking to me! Giuseppe: Okay, he's a-talking to you. You the boss. Mama mia! [after being chased into the rich end of town] Tramp: Well! Snob Hill. Toughy: Hey! Hey, youse guys, look. Poor Nutsy is takin' the long walk. Lady: Where is he taking him? Toughy: Through the one-way door, sister. Lady: You... you mean he's...? Aunt Sarah: What's going on down there? Aunt Sarah: Merciful heavens! My darlings! My precious pets! Oh, that wicked animal, attacking my poor, innocent little angels. Tramp: [at the zoo] We better go through this place from A to Z. Apes? No, no, no use even asking them. They wouldn't understand. Tramp: Uh-uh. Too closely related to humans. Oh-oh! Alligators. Now there's an idea! Tramp: Say Al, do you suppose you could nip this contraption off for us? Tramp: Huh. If anybody ever needed a muzzle, it's him. Beaver: Uh-uh-uh! Not so fast, sonny. Beaver: I'll have to make certain it's satisfactory before we settle on a price. Tramp: Oh, no. It's all yours, friend. You can keep it. Lady: Uh-huh. It's a free sample. Beaver: [proudly] Say! it works ssswell! Jock: Dinnae listen, lassie. No human is that cruel! Trusty: Of course not, Miss Lady. Why, everybody knows a man's best friend is his human. Tramp: [laughing] Oh, come on now, fellas! You haven't fallen for that old line, now have you? Jock: Aye, and we've no need for mongr-r-rels and their r-r-radical ideas. Off with ya now! Off with ya! Off with ya! Jock: Heather Lad of Glencairn, to you! Tramp: Okay, okay, okay! But remember this, Pigeon, a human heart has only so much room for love and affection. When a baby moves in, the dog moves out. Tramp: Just a cute little bundle... of trouble. Yeah, they scratch, pinch, pull ears... Aw, but shucks, any dog can take that. It's what they do to your happy home. Move it over, will ya, friend? Homewreckers, that's what they are! Jock: Look here, laddie! Who are you to barge in? Tramp: "Stop that racket, you'll wake the baby!" And then... then they hit you on the room and board department. Oh, remember those nice, juicy cuts of beef? Forget 'em. Leftover baby food. And that nice, warm bed by the fire? A leaky dog house. 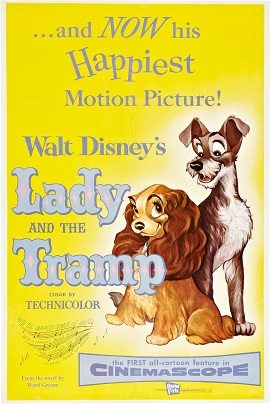 [about Tramp] Peg: What a dog! Lady: [Watching Trusty running and howling in his sleep] He's dreaming. Jock: Aye, dreamin' of those bonnie bygone days when he and his grandfather were tracking criminals through the swamps. Jock: 'Tis time you knew the truth, lassie. It shouldn't have happened to a dog, but... well, Trusty has lost his sense of smell. Jock: Aye, but we must never let on that we know, lassie. It would break his poor heart. Jim Dear: [Giving Darling a hatbox] It's for you, Darling. Merry Christmas. Darling: Oh, Jim, dear. It's the one I was admiring, isn't it? Trimmed with ribbons? Jim Dear: Well, it has a ribbon. Jim Dear: You like her, Darling? Darling: [hugging the puppy] Oh, I love her. What a perfectly beautiful little Lady. Tramp: Say no more, I get the whole picture. Aunts, cats, muzzles... Well, that what comes of tying yourself down to one family. Lady: Haven't you a family? Tramp: One for every day of the week. The point is, none of them have me. Tramp: Not to change the subject, but, um... ever chased chickens? Lady: I should say not! Tramp: Oh-ho, then you've never lived! Tramp: I know. That's what makes it fun. Aw, come on, kid. Start building some memories. Tony: Hey, Joe! Look! Butch-a he's got a new girlfriend. Joe: Well, a-son of a gun! He's a got a cockerel Spanish-a girl. Tony: Hey, she's pretty sweet kiddo, Butch. You take-a Tony's advice and settle down with this-a one, eh? Hehehe. Tramp: This-a one... this-a... Oh! Tony, you know. He's-a not-a speak-a English-a pretty good. Joe: Here's your bones-a, Tony. Tony: Okay, bones. Bones? Whassa matta for you, Joe? I break-a your face-e! Tonight, Butch-a he's-a get the best in the house! Joe: Okay, Tony! You the boss. Tony: [Showing Tramp the menu] Now, tell me, what's your pleasure? A la carte? Dinner? Tony: Aha, Okay. Hey, Joe! Butch-a he say he wants-a two spaghetti speciale, heavy on the meats-a ball. Joe: Tony, dogs-a don't a-talk! Tony: He's a-talkin' to me! Joe: Okay, he's a-talkin' to you! You the boss! Tony: Now, here you are-a, the best-a spaghetti in-a town. Jock: Well, they... they resemble humans. Trusty: But I'd say a mite smaller. Jock: Aye, and they walk on all fours. Trusty: And if I remember correctly... they beller a lot. Jock: Aye, and they're very expensive. You'll no be permitted to play wi' it. Trusty: But they're mighty sweet. Jock: And very very soft. Tramp: Just a cute little bundle... of trouble! Toughy: [about the Tramp's girlfriends] Yeah. But he never takes 'em serious. Boris: Ah, but someday he is meeting someone different. Some delicate, fragile creature who's giving him a wish to shelter and protect. Bulldog in Pound: Like Miss Park Avenue 'ere, eh, Matey? Toughy: And it's curtains for the Tramp. Boris: Ah, but remember, my friends. Even Tramp has his Achilles heel. Pedro: Pardon me, amigo. What is this chili deal? Boris: Achilles heel, Pedro. This is meaning his, uh, weaknesses. Toughy: Oh! Oh, the dames. Yeah. Pedro: And my sister, Rosita Chiquita Juanita Chihuahua. I think. Tramp: Is something wrong, Pidge? Tramp: Yeah. So it is. Lady: I should have been home hours ago. Tramp: Why? Because you still believe in that old "in the faithful old dog tray" routine? Aw, come on, Pidge. Open up your eyes. Tramp: To what a dog's life can really be! I'll show you what I mean. Look down there. Tell me what you see. Tramp: Exactly. Life on a leash. Look again, Pige. Look, there's a great big hunk of world down there, with no fence around it. Where two dogs can find adventure and excitement. And beyond those distant hills, who knows what wonderful experiences? And it's all ours for the taking, Pige. It's all ours. Lady: But who'd watch over the baby? Tramp: [shaking his head] You win. Come on. I'll take you home. Toughy: Well, wow, look youse guys, Miss Park Avenue herself. Bulldog in Pound: Blimey, a regular bloomin' debutante. Toughy: Yeah, and pipe the crown jewel she's wearin'. Bulldog in Pound: Hey, whatcha in for, sweetheart? Putting fleas on the butler? Peg: All right, all right, you guys! Lay off, will you? Toughy: Aw, what's the matter, Peg? Bulldog in Pound: We was only havin' a bit of sport, we was. Trusty: As my grandpappy, Ol' Reliable, used to say... I don't recollect if I've ever mentioned Ol' Reliable before? Puppies: No you haven't, Uncle Trusty. Trusty: Huh? I haven't? Well, as Ol' Reliable used to say... he'd say, uh... He'd say, uh... er... Doggone. You know, I clean forgot what it was he used to say!